Dr. Sheldon Ekland-Olson received the 2013 Outstanding Graduate Adviser Award. The Graduate School Outstanding Graduate Adviser Award annually recognizes the exemplary service of one graduate adviser. Graduate advisers provide an invaluable service to the University and its community of students, faculty and staff, and this award is an opportunity to recognize these individuals. The award includes a $3000 prize, which is presented at the Graduate School/University Co-op Awards Banquet in the spring. I have often shared with friends and mentees interested in graduate training my personal belief and observation that one of the greatest occupational hazards of a career in academia is the ego. I am not using ego as a euphemism for arrogance or a vain sense of superiority, although that could very well be a particular manifestation of the ego. Neither am I referring to the psychological understanding of the ego as one of the key structures of the human psyche. Rather, I am drawing on notions of the ego as described by the philosopher and spiritual teacher Eckhart Tolle. His conceptualization of the ego detailed in A New Earth can best be understood as a false sense of self that is created by the mind. For Tolle, the true self or essence of any human being is formless (some may refer to this as the soul); its value innate and complete from the very start. What is of relevance to this discussion are not the esoteric arguments or details that Tolle’s writings provide, but rather the practical lens he offers for understanding human behavior and social interactions. Tolle explains that the process of identification is the primary means through which the ego develops and functions. He defines identification as the process by which the mind begins to conceptualize and define the self. As Tolle explains, our minds begin to imbue objects (car, house, clothes, books, etc. ), labels/titles (professor, teacher, endowed chairship, parent, child, etc. ), and ideas (dissertations, articles, presentations, books, etc.) with a sense of self. In other words, we accept these objects, labels/titles, and ideas as extensions of ourselves (we identify with them and want to be identified by them); we externalize our selfhood, and ultimately link our sense of self-worth and value to all of the things wherein we place our sense of selfhood. Therefore, the ego is a false sense of self because it represents identification with things that in reality have nothing to do with who we are essentially. What does this mean then for sociologists and other academics? And, why is it an occupational hazard? Sociology, like any other scholarly discipline or field of study, is populated with individuals who love to think and are full of ideas on a range of topics. We are a profession whose chief commodity is ideas and by extension our greatest resource and tool is always believed to be our intellects or minds, which is the very home and source of the ego. We treat our own minds with such reverence that we often are not aware of all it does and how we choose to use it. 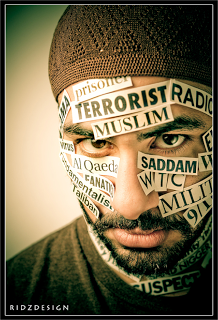 Ironically, I believe intellectually we all can understand how placing a sense of self or identifying ourselves with external objects or labels/titles is erroneous. We can understand how, maybe even why, a Wall Street banker draws a strong sense of self via the material objects she/he may possess, or how an elected leader or those in formal positions of power draw their sense of self from their titles and positions. The problem then becomes any action taken to regulate, constrain, or challenge those things in which people place their senses of self is understood and interpreted as a personal attack that must be defended at all costs. The Wall Street banker balks at financial regulation because it might or will cause them to earn $350,000 instead of $400,000, and because their sense of self has been placed in their wealth it is felt deeply as a violation. When a politician’s authority, actions, or policies are questioned and their position potentially in jeopardy, it is often seen by the officeholder as a betrayal and serious threat, which explains why so many elections are fought ferociously. I am arguing that it is often harder, especially for scholars, to be aware of the many ways we integrate our sense of self with our ideas and intellectual arguments. This difficulty in being aware on some level is understandable. Our ideas, arguments, and analysis ostensibly come from our minds, and how could our minds and the products thereof not be who we really are, right? My observations and arguments presented here, is not to say that our ideas have no relationship at all to who we are, but rather to caution against an over-identification with our ideas as representing all, most, or a lot of who and what we are as human beings. It is this over-identification or over-placement of self into our ideas that structures a vast swath of our professional lives. We all have experienced this misplacement. As graduate students, how many of us have felt the need or impulse to enter into our weekly seminars as intellectual gladiators having or wanting to prove that our interpretation and analysis of the assigned readings is not only correct but also the most insightful? How many of us have witnessed tense exchanges at professional meetings between disciplinary colleagues bent on proving the other wrong or misguided and by virtue themselves right and enlightened? How often have any of us felt the pangs of disappointment, no matter how subtle or pronounced, at the news of a colleague’s work being published or receiving an award, recognition, or funding, feeling as though something has been taken from us? Or, how about the endless comparisons and recriminations that can occur when friends or colleagues are on the job market always waiting to see who gets the “best” job at the “best” institution? The manifestations of the ego, the false self, within academia are countless, as they are with any other profession. However, I would like us to consider collectively the price we pay for the “luxury” of such false senses of self. What is the cost in creating an environment where we evaluate our worth and the worth of our colleagues through the lens of whose ideas are “most innovative,” whose ideas add “most” to our knowledge base, who gets the awards and accolades, and what kind of institution or department one is employed at? The cost is that we create a structure that incentivizes confrontation over cooperation, denigration over constructive feedback, and dismission over consideration. All of this is made possible, in large part, because of the ego, the process by which we come to define who and what we essentially are. We must vehemently defend our ideas because they are a part of us; as sure as our arm is a part of who we are. We must dismiss or qualify someone else’s success so that it does not seemingly diminish our own. We berate ourselves for not getting five campus visits when we had three. Perhaps, in my own opinion, the most costly consequence of this occupational hazard is the zero-sum, all-or-nothing norm that has infiltrated our scholarly-enterprise. This is especially true within graduate student culture, where we often dismiss the entire work of an author because we find one, two, or even three disagreements with what they have presented. Often these disagreements are seen through the prism of our very own work, and thus have a vested interest because of our ego in the debunking of someone else’s scholarship. Many things are evaluated through the lens that either all information presented is right or none of it at all. We throw the proverbial baby out with the bathwater. As a result, we miss out on the opportunity to honestly and thoughtfully learn from our colleagues and peers, and vice versa. Additionally, we hold ourselves hostage to the impossible standard of always being right in every detail as it concerns our research. We might likely find it hard to admit errors and mistakes because of how our entire body of work will be evaluated, but especially of our fears of what it says about who we are as people if one or more of our ideas may not be correct or capture the full complexity of a particular phenomenon. The ego does not allow for a humble self-reflexive analysis of our or anyone else’s work. Contrary to the tone at times of this piece, I am an optimist. I do not believe that sociology (or any discipline) or our profession as scholars is always mired in this dynamic; however, it all too often is. I have experienced classes, colleagues, and mentors who have been very generous in their simultaneous support and constructive feedback. The question becomes: how do we more consistently interact and treat one another with consideration, cooperation, and constructive feedback? In my observation, it often starts with an awareness of where and how we place our sense of self, where we draw our worth and value from, and an acknowledgement and sincere acceptance that our essence as individual human beings lays outside the scope of scientific measurement and evaluation. I have by no means perfected, or even come close, to fully embodying this shift in awareness; however, I do have a vision for how sociology and sociologists in our everyday activities can fulfill the very potential and promise of our discipline and profession. It is this potential and promise that inspired me to begin the long journey of becoming a trained sociologist. So now begins the conversation, the real work of becoming a more perfect union, a better beloved community. What is your vision for our discipline and profession? How might we improve collectively? David Glisch-Sánchez is a queer Latin@ scholar originally from the midwest (Milwaukee, WI to be exact!). 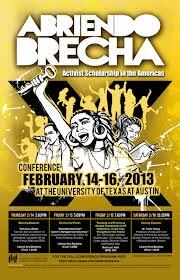 Currently, he is pursuing his Ph.D. in Sociology at the University of Texas at Austin. His dissertation project is tentatlively titled “‘Listen to what your jotería is saying’: Queer Latin@s Confronting Violence, Seeking Justice.” In this project, he is investigating how transgender, lesbian, gay, bisexual, and queer Latin@s have experienced social harm/violence during the late 20th and early 21st centuries, what is the socio-historical context for their experiences, and how have ideologies of Latin@ gender and sexuality shaped these experiences. Erika Denisse Grajeda is a Sociology doctoral student. Her research interests include informal economies and gender. She is currently doing research on women day laborers in New York City. When not bombarded with graduate school stuff, she likes to drink beer and cook. Last week, UT-Austin had the honor of hosting Dr. Michael Omi, Associate Professor of Ethnic Studies at the University of California Berkeley. Organized by the Department of Asian American Studies and co-sponsored by a number of other departments and center, Dr. Omi’s visit included a roundtable discussion with five UT faculty members from American Studies, Anthropology, History; an evening talk; and an informal lunch with graduate students. During these events, discussion not only returned to the significance of racial formation theory in the U.S.-based scholarship of race and ethnicity, but also examined the potential for these theories to examine both the durability and flexibility of “race” within global contexts. We invited sociology graduate students Vivian Shaw, Amina Zarrugh, and Christine Wheatley to share their reflections on these stimulating talks. In his evening talk, Dr. Omi focused specific attention on how Asian Americans, as a socially constructed “group,” are located within a number of racial paradoxes. He unseated several ideological myths around “Asianness” and emphasized how Asian Americans have been stratified simultaneously within a white-black racial binary and relationally to other minority groups. Of particular interest to Omi was the “whitening hypothesis,” a sociological theory suggesting that high achievements around education and income and high rates of “outmarriage” experienced by many East Asian Americans might suggest a socioeconomic integration with white Americans. In asking what it means to suggest that Asian Americans are now being “whitened,” Omi argued that we interrogate what it means to develop a framework of racial analysis that assumes the stability of the category of whiteness and equates progress with the expansion of “more others” into the folds of white respectability. To what extent does such a paradigm demonstrate an investment in the privileges of whiteness? Throughout his visit, Omi drew connections between the complex political meanings of Asians Americans in the U.S. and the production of knowledge about race within the politicized spaces of academia. 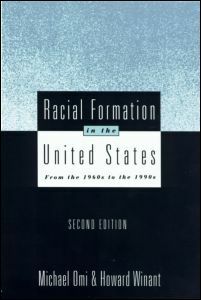 He seemed to favor an anecdote dating from the publication of “Racial Formation in the United States”: he and Howard Winant (the book’s co-author) were both surprised and disappointed when they found the book had barely made a ripple within the social sciences, but was instead taken more seriously within the humanities and legal studies. Admittedly, Omi’s criticism of the marginalization of race and ethnic studies within intellectual institutions found some coaxing from his anxious audience. Many faculty and graduate students attending the talks expressed concerns about an undeniable slashing of resources for ethnic studies not only within academia at large, but quite acutely at UT-Austin. Among a variety of measures, targeted cuts have occurred in the form of low rates of tenure for faculty of color and eliminated funding for program support staff. Over sandwiches, Omi offered advice to an intent room of graduate students worried about the implications of such cuts on critical research and their own futures within universities. In his critique of the racial politics pervasive within academic institutions, Omi offered some alternatives. He talked of his collaborative work with anti-racist community-based organizations and their efforts to “translate” academic ideas into policy-friendly language. Moreover, Omi celebrated the creative applications of racial formation theory that he has witnessed since the book’s publication and the innovative ways in which research on race and ethnicities continue to grow. Dr. Omi’s visit served as a powerful reminder of both what is politically, socially, and intellectually at stake when institutions of whiteness go unchallenged and the creative potentials for anti-racist scholarship. 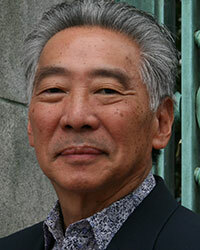 In his evening lecture, Michael Omi discussed the relationship of Asian Americans to whiteness, the instability of which is nevertheless symptomatic of a persistent racial hierarchy. Asian Americans are often exalted as the “model minority” given their disproportionately high education and income levels relative to other ethnic minorities and to whites more generally. Historically, Asian Americans have always been situated against a landscape of U.S. black/white relations but are assigned to different sides of the color line at particular moments. Omi underlined the ways by which, compared to other racial and ethnic groups, Asian Americans are especially vulnerable to a racial repositioning during hostile and tense political climates. From the Chinese Exclusion Act in the early 1880s to internment camps for the Japanese during World War II and contemporary virulent discourse regarding economic threats to the U.S. posed by China, examples of the contingent position of the group in the American racial hierarchy abound. This ambivalence is further underscored by recent examples that illustrate an enduring but increasingly politicized perception that Asian Americans are threatening to whites given the U.S. public’s collective anxieties regarding job outsourcing to South Asia, unemployment, and American performance in STEM (science, technology, engineering, and math) fields; this is exemplified further in debates about college admissions such as that of recent U.S. Supreme Court case Fisher v. University of Texas. Of paramount significance to sociologists, particularly those studying race and ethnicity from a quantitative perspective, was Omi’s discussion of whiteness as a category. Omi proposed that the measures typically regarded by social scientists as signs of inclusion and assimilation – such as intermarriage rates – ought to be more critically regarded as an expression of the continued salience of a racial hierarchy and racialized discourse. The high levels of intermarriage between Asian American women and white men, he argued, cannot be understood solely as the transcendence of racial stereotypes or cultural difference but, rather, as their very affirmation. Cultural stereotypes about Asian American women as objects of exoticized sexual desire suggest that the gender gap in Asian American out-marriage may be intimately connected to such pernicious and problematic discourses. In this way, sociologists ought to consider more critically and creatively categories of racial and ethnic identification as well as the contested meanings associated with “indicators” of social experience, such as assimilation. context of a post-9/11 political atmosphere, the “ArabMuslimSouthAsian” body has been racialized in specific ways (which are invariably gender-specific). Like Asian Americans, many members of these groups were historically regarded as “white.” Furthermore, and unlike Asian Americans, individuals from North Africa and the Middle East continue to officially be regarded as “white” according to the definition of the “white” category in the U.S. Census. The case of Arab and Iranian Americans parallel in many ways to that of Asian Americans yet introduces another series of questions with a different valence. A question often posed is “What does it mean to be categorized as ‘non-white’?” This case, instead, turns the question on its head to ask: “What does it mean to not be disaggregated from the category of ‘white’?” These queries and perplexities require that we interrogate not only what it means to be Asian American, Arab American, or Iranian American, but what “whiteness” means, historically and presently, in the United States. 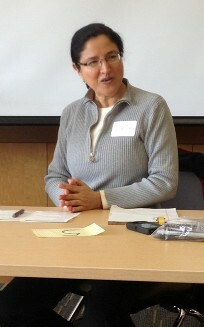 Amina Zarrugh is a PhD student in the Department of Sociology. Her research focuses on gender, religion and nationalism in Libya. Vivian Shaw is a PhD student in the Department of Sociology. Her research focuses on race, gender, and technology in Japan and globally. Christine Wheatley is a PhD student in the Department of Sociology. Her research centers on processes of deportation, both as a form of exclusion and of forced return migration. Scouting and Homosexuality : A Case for the Gender Police? Over the past few weeks, the Boy Scouts of America’s policy on gay Scouts and Scoutmasters has been featured heavily in the news. I am an Eagle Scout who studies masculinity here at the Sociology department and thus feel compelled to weigh in on this important issue. But to properly unpack why heterosexuality is so near and dear to the Boy Scouts, we need to establish a bit of historical context. Allow me to set the scene: It’s the year 2000. Y2K has passed, Britney Spears is still culturally relevant, and we’re still seven long years from the iPhone. 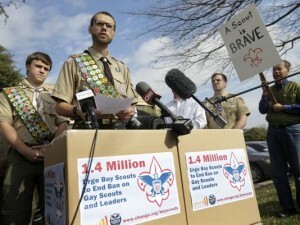 Over on the Supreme Court, the issue of gays and Scouting is already at hand. In the 2000 case Boy Scouts of America vs. Dale, the court ruled that the Boy Scouts of America (BSA) were legally able to exclude homosexuals from BSA participation under the constitutional right to freedom of association. 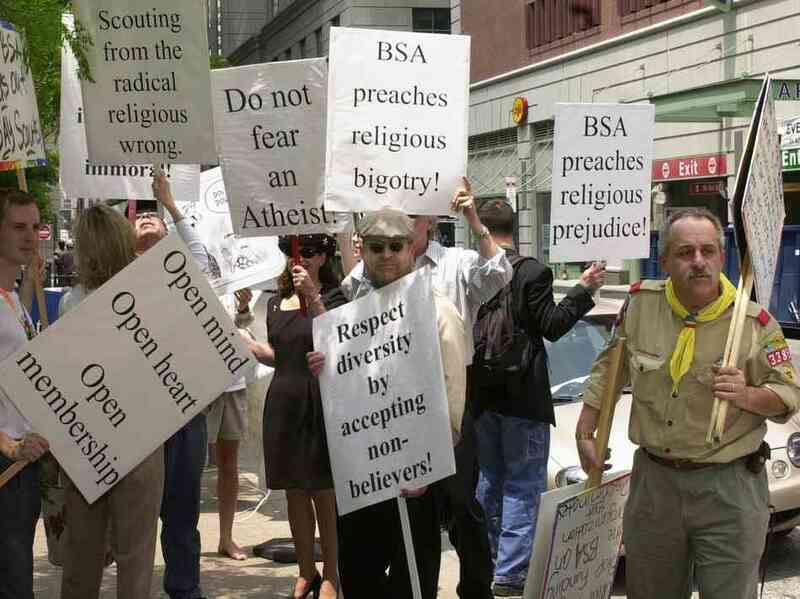 Because BSA operates as a private organization, the court saw exclusion as justified when “the presence of that person affects in a significant way the group’s ability to advocate public of private viewpoints.” According to the court arguments, opposition to homosexuality is part of BSA’s “expressive message” and thus allowing gay male leaders or scouts would interfere with that message. Which begs the question: What does “expressive message” mean, and why is homophobia part of the message? Boy Scouts was first founded by Sir Robert Baden-Powell in England. Baden-Powell formulated a militaristic and authoritarian vision for the British Boy Scouts, stressing obedience and duty. Scholars have likened this version of Boy Scouts to a factory producing uniform men “under detailed specifications for particular uses [with] both supplied by a coherent ideology stressing unquestioning obedience to properly structured authority” (Rosenthal 1986). Essentially, the job of Boy Scouts was to make “manly” men who would then slide easily into discipline-heavy, autonomy-light positions like factory work, middle management, and ideally the ranks of the military in the service of the British Empire. In the transition from British Boy Scouts into the Boy Scouts of America, we see a reformulation of Scouting to fit its new American setting. The secular and imperial social context of England produced a Boy Scouts that was equally secular and aspired to produce future soldiers for the British Empire. In the US, we took the militaristic garb and organization, added copious amount of quasi-religious morality (aided by the essential part churches have in hosting Scout troops), and put it in the service of shoring up a “crisis in masculinity.” Hold on a sec: crisis in masculinity? Where did that come from? With the “feminizing” effects of the big city, female teachers, and a life of waged labor seemingly entrenched into modern social life, men looked for ways to “masculinize” boys early in their development. This, they hoped, would inoculate them against the deleterious and emasculating winds of 20th century existence. And HERE is where Boy Scouts enters stage right. Boy Scouting in America – like its British counterpart – was created with the express purpose of “masculinizing” boys. We might think of Theodore Roosevelt as the personification of the kind of masculinity the BSA was hoping to produce: strong willed, adventurous, self-sufficient, knowledgeable about nature and camping, definitely not feminine and DEFINITELY not gay. And thus the good ship BSA continued to sail for many a decade. It should come as no surprise that being “physically strong, mentally awake, and morally straight” and spending weekends with your Dad became quite uncool over the years. Equally uncool was the idea of spending the night in some mosquito infested park instead of hanging out at your friend’s house eating delivered pizza in the air conditioning. When I first came to Scouting in the 1990s – no doubt partially borne from my father’s own observed “crisis in masculinity” in his overweight, clumsy, bookish son – it was clearly a social world operating under Fight Club rules: no one talked about being in Boy Scouts, no one actually wanted to be in Boy Scouts, and in fact, there IS no Boy Scouts. My troop was populated by awkward young boys, and many of them – like me – were pushed into Scouting by their fathers as a way to bond and learn about being a man. We learned outdoor skills to be self-sufficient. We learned what to do in emergencies and gained a sense of agency. We took turns being patrol leaders and learned leadership. We even dutifully absorbed guidelines on personal hygiene, grooming, and ethics. In some ways, you might even call Scouting “Masculinity for Dummies,” albeit a masculinity that seemed more suited for a bygone age where the square knot and orientation-by-compass were essential daily tasks. The point was, the popular guys, the guys who got girls, the guys who were on the football team – these were NOT the guys at my troop meeting. We were guys who knew more about Lord of the Rings than women or sports; we named our patrol after the Warg, a vicious animal from Tolkien’s series. That is what our fathers sensed, and that is partially why we all gathered in that room on a weekly basis. As any good sociologist knows however, norms are socially and historically contingent and what is “good, true, or possible” in a given social context will always change, if given enough time. To be sure, the contemporary BSA experience still attempts to turn boys into normative, masculine men. But the boundaries of normative masculinity change. Most of us live in big cities, work for a wage, have been taught be female teachers…..and yet there is no dearth of masculine men. While not completely normative, it’s even OK for men to be fashionable, be sensitive, be vulnerable. Thanks to those Peter Jackson films, it might even be cool to like Lord of the Rings now! Other things have showed less progress, however. One of the most universal aspects of masculinity is its tendency to define itself as whatever is not feminine. Thus misogyny and female objectification are still rife in our society, and we have Boy Scouts and Girl Scouts, not People Scouts. Hegemonic masculinity and heterosexuality are also deeply associated. Thus homophobia – especially among adolescent men, according to CJ Pascoe – continues to exist. On this last point however, all is not lost: Pascoe’s work on high school masculinity revealed that while a gay identity was frequently used as a feminizing epithet, attitudes towards actual gay and lesbian students were more complex and even respectful. According to Pascoe, while calling other teenagers “fag” is a powerfully stigmatizing word used to hurt and demean, it is primarily deployed to chastise teenagers that are acting feminine instead of those who choose a gay identity. OK, now we’re caught up to the recent kerfuffle over gays and Scouting. Less than two weeks ago, the BSA announced a shift in their “no gays allowed” policy upheld by the Supreme Court in 2000. Rather than a blanket “gays allowed” reversal, their shift was to be based on a quasi-“state’s rights” approach, where each local Scout council would be allowed to decide the policy that best suited their social and cultural context. That way, the troop in San Francisco could march in the Gay Pride Parade, the troop in Oklahoma City could tell their Scouts that homosexuality was neither moral nor straight, and the BSA could wash its hands of any responsibility. The liberals get social equality, the conservatives get the right to their own views, and the libertarians get “Big BSA” off of their backs so things can be decided at the local level. Everyone wins, right? If you’ve paid any attention to the “culture wars” surrounding gay marriage and abortion, you probably already know the answer: Of course not! Progressive supporters of the change said this would revitalize the dwindling interest in Scouting; conservative opponents said this would produce a wave of departures from church sponsored troops. Change supporters said this would create important dialogues; opponents said this would create ideological walls between troops. The companies that use liberal ideology to sell their products cheered and gave the BSA money; the companies that use conservative ideology to sell their products jeered and threatened to deny funding. But with our historical context and sociological imagination up and running, we can see that this is slightly more complex than the media narrative. The Boy Scouts of America were generally founded to inculcate masculinity in boys and specifically to endorse a hegemonic masculinity that is heterosexual at best and homophobic at worst. So when the Supreme Court or Random Conservative Pundit says that allowing gays in Scouting goes against its foundational “expressive message,” this is quite a bit of truth in this. The rub is the aforementioned sociological truism that gender norms are dynamic, fluid, and subject to change across time. If today’s society, today’s Boy Scout leaders, or today’s Boy Scouts decide that excluding gay people on the basis of sexual orientation is no longer acceptable, that truth is as valid and real as the “truth” of masculinity the BSA was founded upon. If the hard fought legal battles and cultural visibility the GLBTQ community have won in the decades since Stonewall mean that homosexuality is no longer seen as immoral or unclean to today’s Boy Scouts – as evidenced by the 1.4 million signatures a group of Eagle Scouts delivered to BSA headquarters – then that is something their leaders have to deal with honestly, responsibly, and with an open mind. Perhaps that will still be the case even with the decision Wednesday from the BSA to have more deliberations before a final decision. On one side stand people who no longer see a conflict between social acceptance of homosexuality and “being a man” in the year 2013. On the other side are people who sense that something fundamental about masculinity and Scouting is changing. Both may be right. But as our trip through history shows, this has as much to do with masculinity and gender policing as it does with homosexuality. Paul Woodruff, inaugural dean of the School of Undergraduate Studies, taught a similar class in the spring of 2012. The Art of Giving also centered around giving away $100,000 to the charity or charities that students determined were most deserving. Go to the UT Know feature here. Courtesy of Mystie Pineda and Susie Cansler, Texas Student Television.